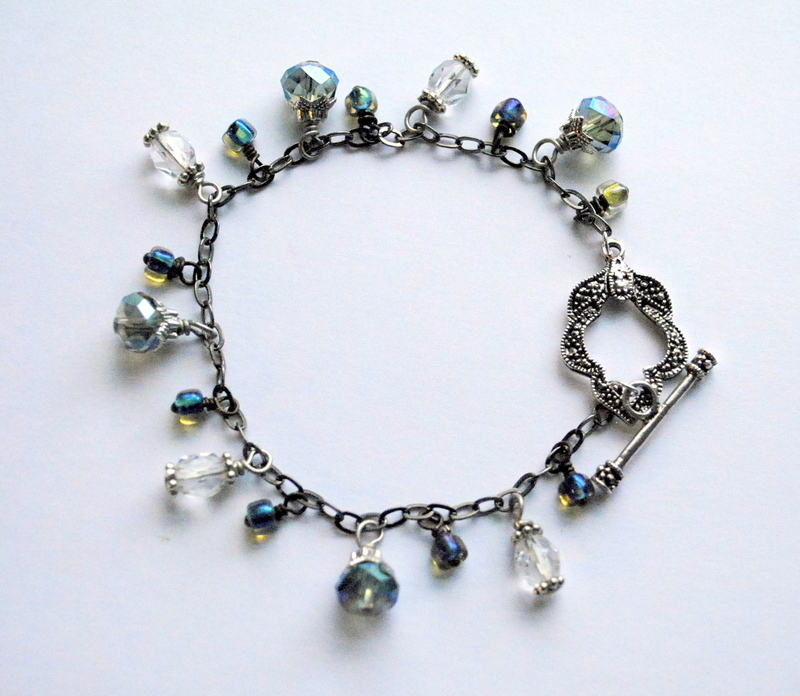 Bead Soup Blog Party - Take One! It's here! Today is the first of three reveal dates for the 7th Bead Soup Blog Party, created and hosted by Lori Anderson (sending you a BIG thank you and hugs through cyberspace for all the hard work you do!) The other dates are 4/6 and 4/13 and are sure to be amazing! In a nutshell, over 500 amazingly talented artists from all over the world are a part of this event. The amount of work Lori puts into this is just incredible and I wanted to say thanks for everything she's done to pull this together. 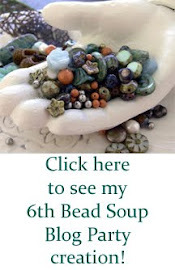 My partner is Deana Hager so please be sure to head over to her blog and check out what she's created with my bead soup! Deana sent me a fun bead soup of earth-tones to work with...something I don't personally gravitate to, which made this a great challenge! This is my bead soup (minus the focal piece and toggle clasp...the picture I had of the whole soup is somewhere in cyberspace). 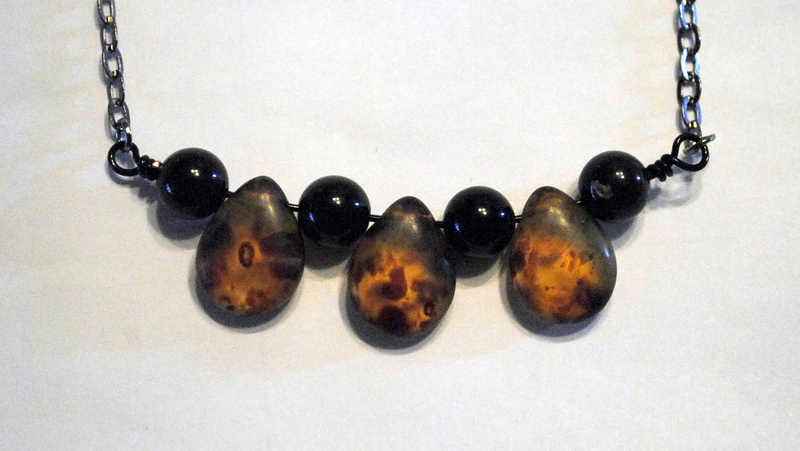 I took three of the tortoise shell teardrop beads and paired them up with some black onyx beads I had in my stash. I created this pendant by wire wrapping them on one piece of wire and paired it with a gunmetal chain. It made a dramatic yet simple necklace that I can't wait to wear! 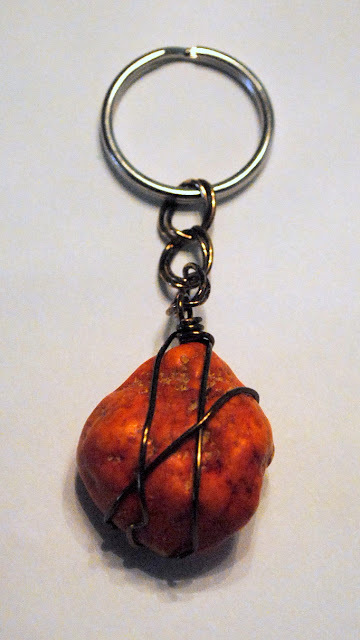 Deana sent me this fun orange stone as my focal piece. Neither of us are sure exactly what it is, but it's a great color! This piece was too heavy for a necklace but it made a perfect key chain holder. I wrapped it with some antique bronze wire I had and attached it to the key chain ring with a left-over section of a large antique bronze chain from another project. Now for my favorite piece...Deana sent me an amazing toggle clasp and I needed to create an amazing necklace to live up to it. 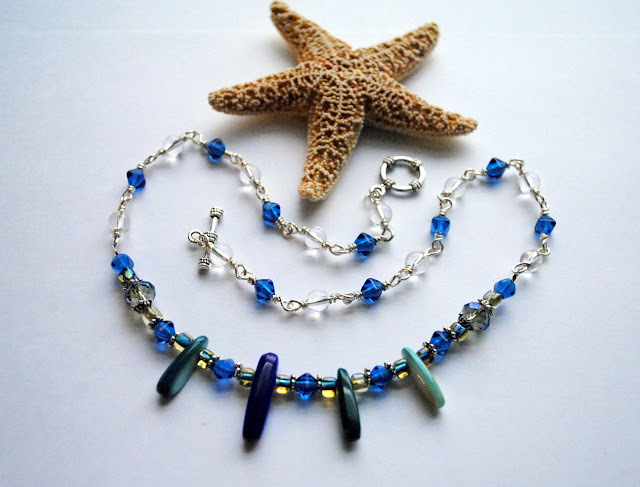 The curves in the clasp reminded me of the waves on the ocean (OK, you knew I had to bring a sea theme in somewhere!) so that provided the inspiration for this amazing necklace. 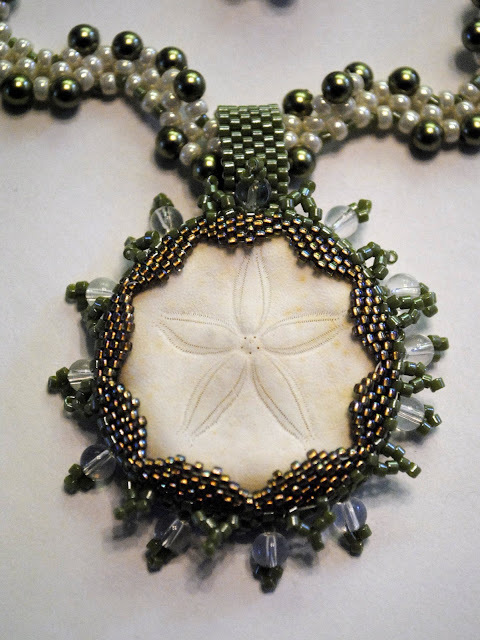 I started with the pendant, and used a sand dollar cookie. (It's like a traditional sand dollar but about 1/4 inch thick instead of flat.) I created the bezel and loop using peyote stitch with the most amazing shade of green Delica 11/0 beads and fun metallic gold/green 15/0 beads. I used some clear quartz round beads I had left-over from another project for the embellishment around the bezel. Considering this was my third attempt at beading a bezel, I was thrilled with how it turned out! So I had this amazing pendant and clasp, but no necklace...and it stayed this way for weeks. I tried four or five different beaded necklace patterns, but they just didn't fit with what I had already created. So I started looking through my old magazines when I found this amazing pattern in Bead and Button, Right Angle Weave special edition (2008). Designed by Julie Glasser, this variation of the RAW stitch was perfect for my necklace. 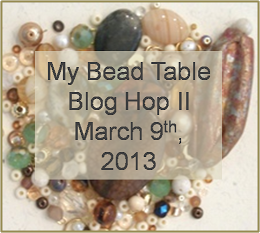 So that's my story for this Bead Soup Blog Party! It was fun to be challenged with the earth-toned beads in my soup and I taught myself a couple of new stitches looking for the right necklace, so it's been a productive time for me. 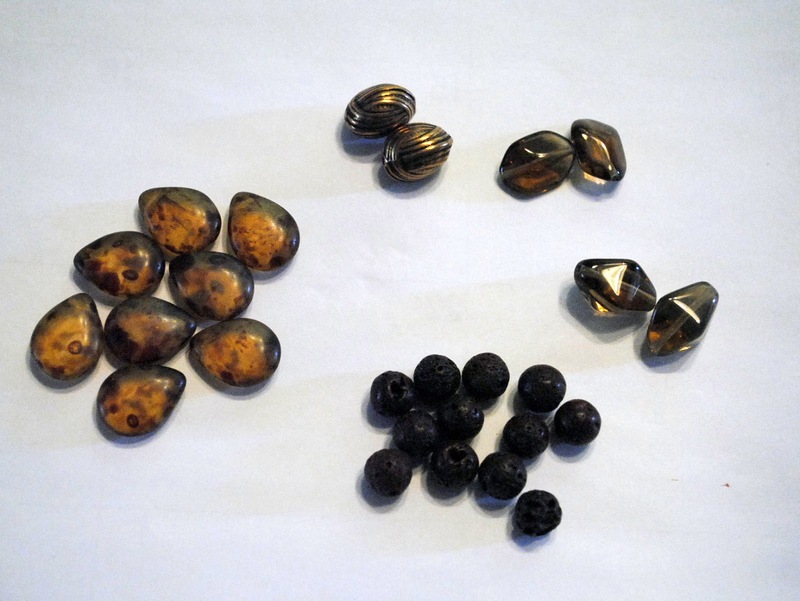 Be sure to check out the other talented artists and see how their bead soups inspired them to get creative! Click here to check out all the talented people from the first reveal! It's been spring on the calendar for almost a week now, but you wouldn't know it by looking out the window yesterday! I love winter and I love watching the snow come down, so yesterday was a dream day for me. The snow was light and airy and it was just a beautiful sight outside my window all day long. 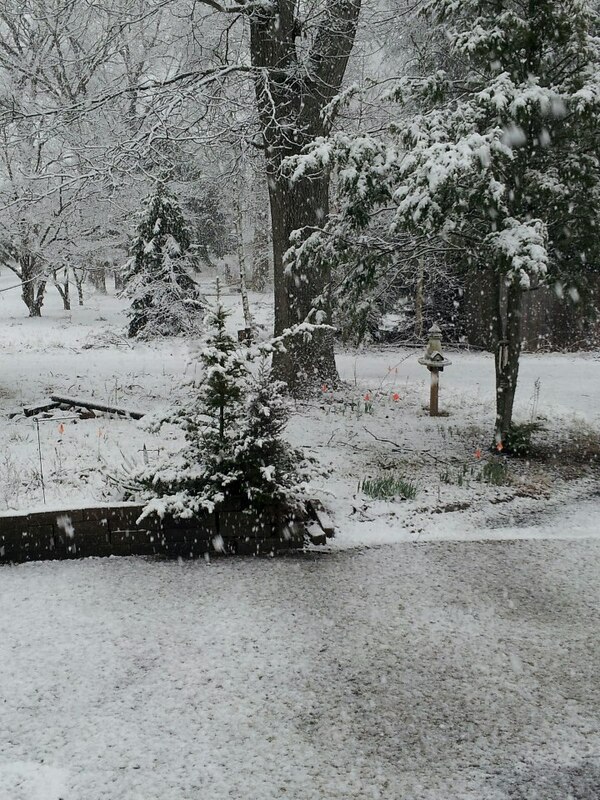 But that's not the picture you expect to see when you think it's spring! One of my spring rituals has always been to walk around my yard to where the daffodils grow and watch for them to start pushing out of the ground. When she was little, my daughter loved to wander through the yard with me, reminding me of all the places the daffodils would be. 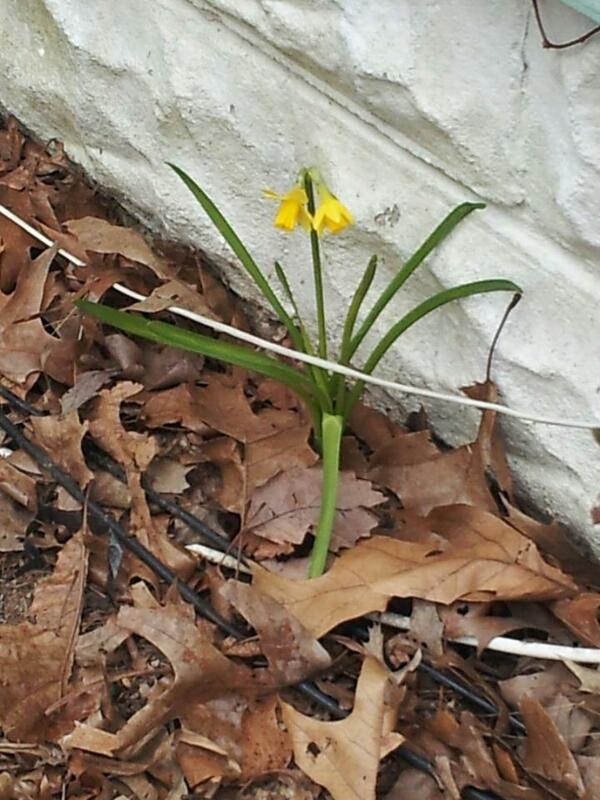 This year, the daffodils are up and nice and tall already. The blooms are huge and just about to burst! The weather still pretty cold, though, and with the freezing temperatures at night, I just don't have that sea of yellow yet. This little plant is tucked away up near the house (out of the wind) and between the leaves and the fact that it gets a lot of sun throughout the day I guess it was ready to bloom. Reminded me of how life is sometimes...seems like all you want to do is just find the sunshine and bloom but the storms just won't stop coming. But the Easter season is the perfect time to remember that the dark days don't last forever and the storms will stop and when the sun comes out it's a beautiful day. While I can't show you my pieces (partly because they're not all completed) I can show you the new stitch I taught myself that will be a big part of my reveal. I've seen lots of jewelry that's made with the RAW stitch (right-angle weave) and it always looked really complicated so I shied away from those patterns. But I found a pattern called "Hugs and Kisses" and I knew I had to learn how to make it! 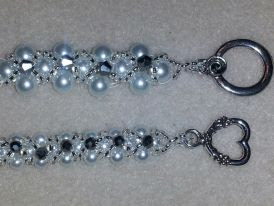 This the same pattern, but using different size beads to create a completely different look. I found a variation of the RAW stitch in Bead and Button September 2008, credited to Julie Glasser. It uses three different size beads to create a wave pattern in the design. I started with these dreamy 8/0 pearl seed beads. They create the main color of the bracelet. 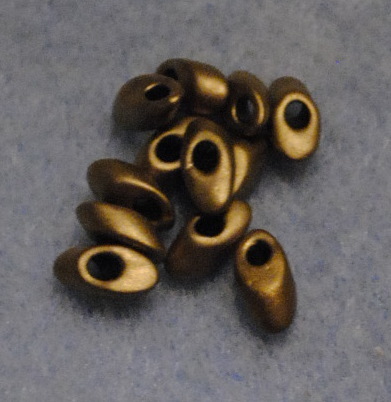 Then I dug around in my stash for these fantastic magatama beads. I found these in a little bead shop when vacationing in Maine (The Beaded Moose) and it was one of the times I bought beads with no idea of how to use them or any idea of what I wanted to do with them. I finished off the color palette with these luscious green Delica 11/0 seed beads. Perfect for a spring creation, don't you think? The pattern starts off by creating a string of RAW stitches with the 8/0 beads. 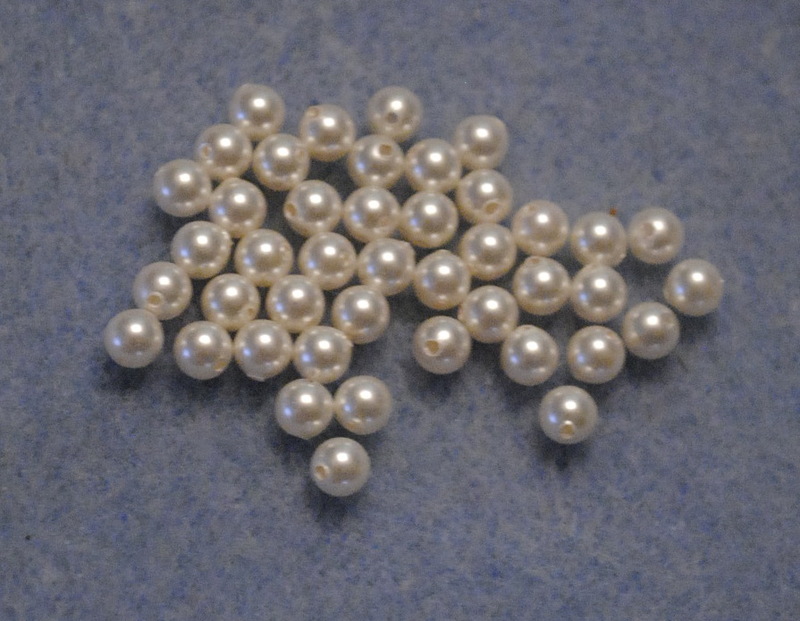 Then you add in alternating 11/0 beads and magatama beads. The size difference creates the wave/rippling effect. If you've never worked with magatama beads, be aware that they angle different ways depending on what side you pick up...Luckily I caught this when I did! Here's the beginning of the second side. 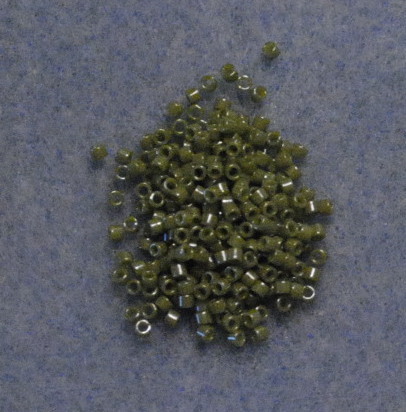 You can see how the wave effect is magnified with these great beads! You have to be sure that there is enough tension in the string when you are weaving the outer rows so that the curves stay in place. I added this antique bronze toggle clasp to finish the bracelet. I liked that the clasp has a geometric feel and that it and it pairs with the magatama beads so well. So, now that I've successfully completed this project in my new stitch, it's off to start working on my piece for the big reveal! This week’s Featured Artisan on Share the Love…Blogger’s Unite is Sebnem Graham and Duygu Anne of Sebsurer. At Sebsures you will find stunning Fashion Accessories in original designs.All creations in our shop are limited edition and unique... Our inspiration comes from everything, everywhere. Had kind of an epiphany the other day...I don't put my family first. Now before you start throwing rocks (or tomatoes or whatever you use to throw at someone), let me explain myself. I have been a stay-at-home mom for 13 years, since my daughter was 3. God provided my husband with a job (and my college loan was paid back early) which allowed me to stay home and it was an answer to a long-prayed prayer. I gave up a career in management without any hesitation and I don't regret that decision for an instant. I devoted my life to homeschooling our daughter and learning how to be a loving, caring wife. But in one area my priorities are waaaaaaay off. It's in how I take care of my house. I'm not Suzy Homemaker...never have been. My grandmother and aunts have homes that are never out of place, no matter when you drop by to visit. Not my house. It's not dirty, just cluttered. As we were working on getting the flower beds ready for spring (yes, my back is still struggling to get back to where it was before...my chiropractor told my husband that he might need to tie me up so that I don't over-do it like this again) I realized that it has been years since they were cleaned out. What prompted me to get out and get it done this spring? Because we're planning to put the house up for sale and this is one of the first things a potential buyer will see. My teenage daughter asked recently why I insist on manners be used at home. She said that home is where we're supposed to be comfortable and relax, isn't it? So why do I make such a big deal about it? I told her that it's because how we live at home is how we will act around others. That the people we live with are the most important in our lives and that they should get the best we have to give. After dinner, as I was washing dishes, I looked around the kitchen. And the dining room. And the living room. And the rest of the house. I really looked around as if someone called and wanted to come over in 15 minutes. Little piles of clutter are scattered everywhere. Some lingering winter decorations are still scattered here and there, lost and out-of-place with spring just around the corner. Piles of mail that need to be shredded are taking up space on the end of the table. And then it hit me...I would do things so much differently to get the house company-ready than I do for my family. So today is the new start. I won't get everything done today. It's OK. I'm taking a room and going to look at it with fresh eyes. Some things are going to have to go. But that's OK, too. Because it's not the things that are important. It's the people. I love spring and finding all the daffodils in my yard pushing up through the leaves is something I've done since I was a little girl. My daughter decided several years ago that she's not intersted in walking the yard with me, but I still do. And I raked the leaves. Because I have three hernated discs in my lower back, the last thing I'm supposed to pick up is a rake, but I just couldn't resist. And now I'm paying for it. But I have to say it was worth it to see the beds ready for the mulch. Once we have them ready, I'll be sure to take pictures and show you all. But until then, my chiropractor says that I have to let someone else shovel the mulch. So I guess I'll have to sweet-talk my hubby and daughter into doing the hard work that's left! 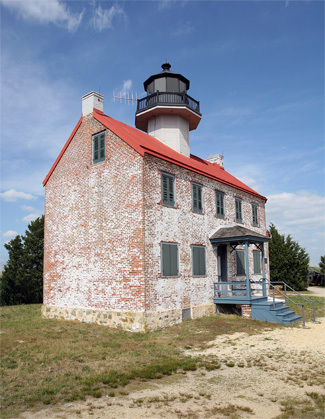 Growing up, we lived a bike ride away from East Point Lighthouse. It's located on a little inlet off the Deleware Bay in Heislerville, NJ and is an amazing place to visit. The ocean has always been a special place for me to go...the smell of the salt in the air, the sound of the waves crashing along the beach...I love everything about it! This blog hop has been put together by Lisa Lodge and there are about 20 of us participating. Lisa sent each of us a beautiful selection of beads, either "Sand" (tans, creams, oranges and browns) or "Sea" (blues, greens and purples). 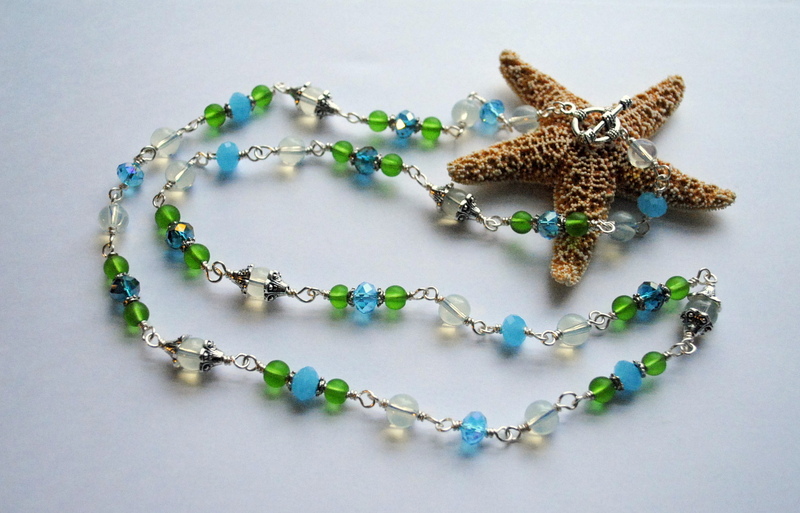 As you can see, my selection of beads was inspired by the sea. Isn't this an amazing selection to work with?!? I love long earrings! (I have long hair and small, delicate earrings tend to get lost in it all.) I like creating earrings with a bit of sparkle and movement. This wasn't the original design, however. I planned to make these earrings dangle with lots of these amazing triangle beads and some of the round blue and green beads. But when I put these on to start the design, I was struck by their simple beauty. So I left the design alone instead of trying to make it fit the image in my head. Charm bracelets are a favorite of mine to create and I really love the sparkle of this one! I originally started with a silver chain, but the clasp Lisa sent looked so much better with the gunmetal chain. I used a combination of black head pins and dull silver head pins just because I didn't want it to become too dark. The smallest beads on the bracelet are my favorite of the whole bunch. 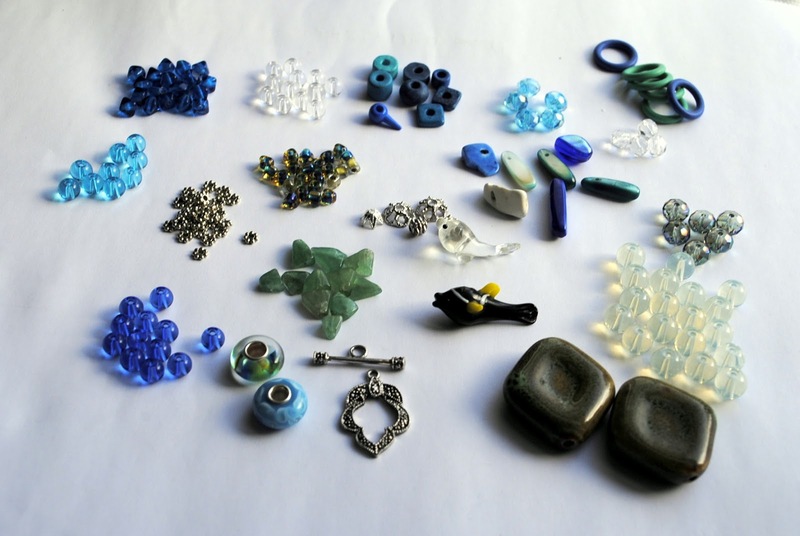 They are small triangle-shaped glass beads that have blue and green and yellow hues. They are so small and I wanted to create a piece where they were an important part of the design, not just an accent to the larger beads. I love the milky round beads that were part of my "Sea." 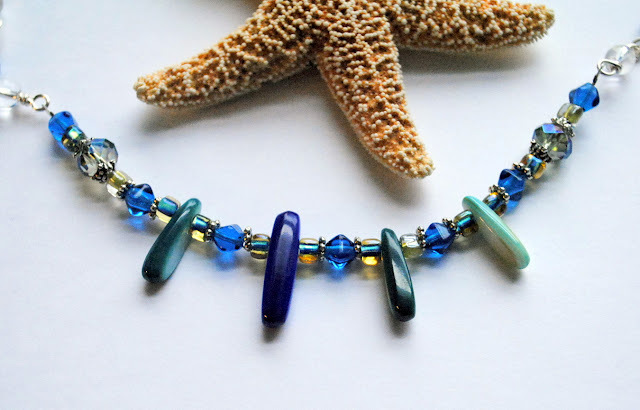 They compliment the bright blues and greens of the other beads. This is my favorite creation of this challenge! I wire wrapped alternating clear and blue beads for the main part of the necklace. I added a silver toggle clasp that reminded me of the life preservers on boats and kept with the nautical theme. I love the front section of the necklace! 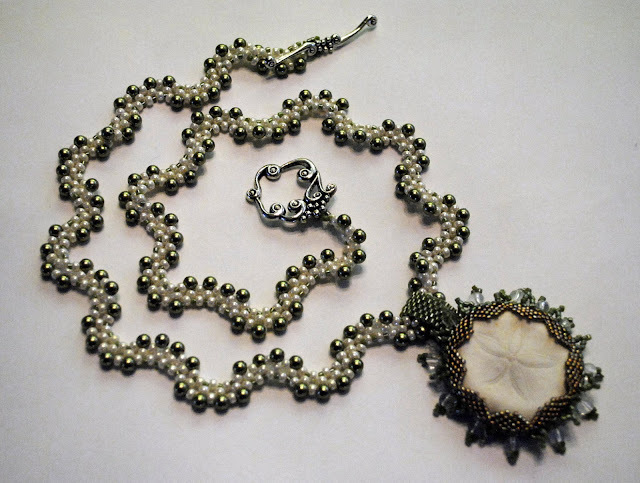 I took the long beads, the rest of those little triangle beads, some blue beads, two rondelles and a bunch of daisy spacers and strung them together. I tried wrapping them into sections but just didn't like the look. Here is the list of the other people who are a part of this blog hop...I hope you are able to check out the amazing jewelry they created with their kits! 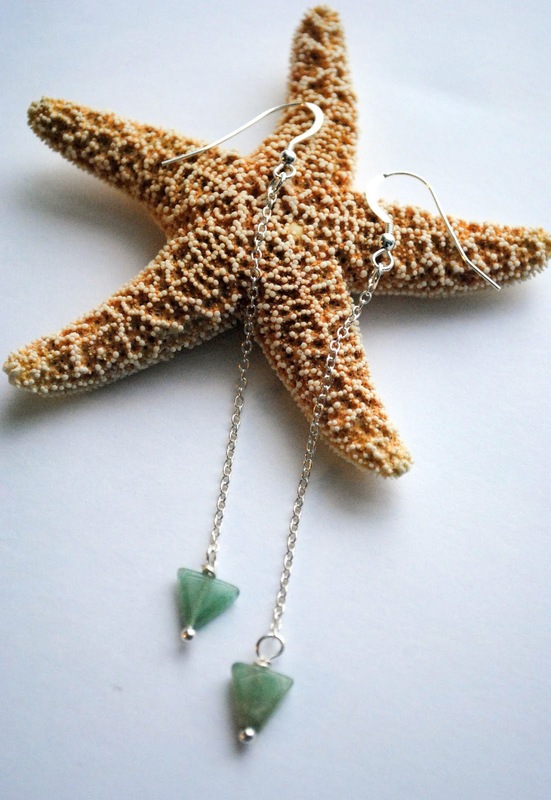 This Weeks Featured Artisan is Rebecca of Raige Creations. You will find handmade creations of Toekini's, Cozies, and more! You will also find Jewelry by Bridget, and unique vintage and antiques at Raige Creations! Grab the code for your blog HERE Are you On Fire for Handmade? Raige Creations Is!